It does so much more than mix! 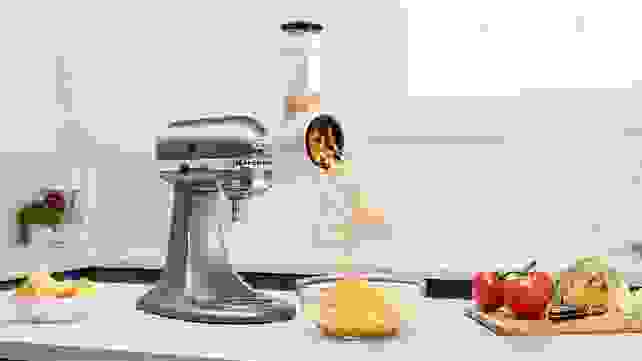 For many people—myself included—owning a KitchenAid mixer is a point of pride. 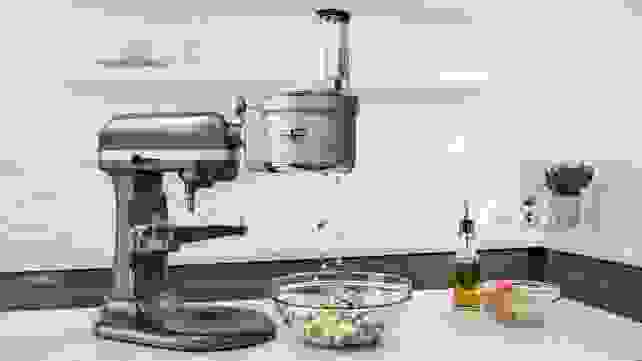 These stand mixers are widely regarded as some of the best of their class. Case in point: the KitchenAid Artisan Stand Mixer took home our award for the Best Stand Mixer and the Professional Series was one of the top performers too. 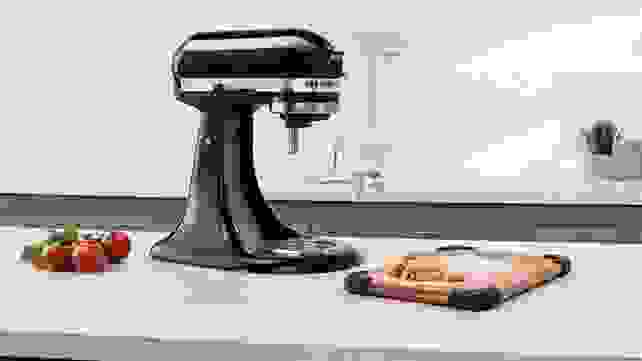 You’ll definitely want to use your stand mixer for whipping up meringue and mixing cake batter, but did you know that a KitchenAid can do much, much more than help you make desserts? 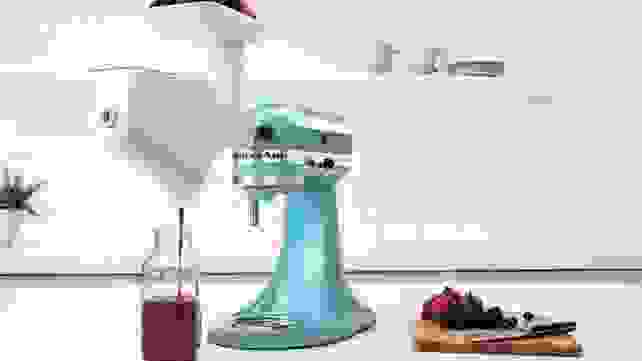 These countertop appliances can be equipped with a wide variety of attachments that make them an incredibly versatile addition to any home kitchen. So move over, Instant Pot—the KitchenAid is just as versatile and valuable in your kitchen. 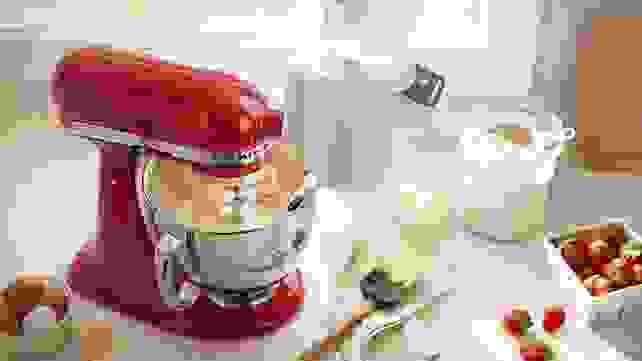 The following are 16 things you probably didn’t know you could do with a KitchenAid mixer but will want to start doing ASAP. Spiralize zucchini, carrots, potatoes, and more. Spiralized vegetables are all the rage right now. You can even buy pre-spiralized zucchini at the grocery store! While the best spiralizer we tested is inexpensive at just $9 on Amazon, it's still a manual process to make zoodles. 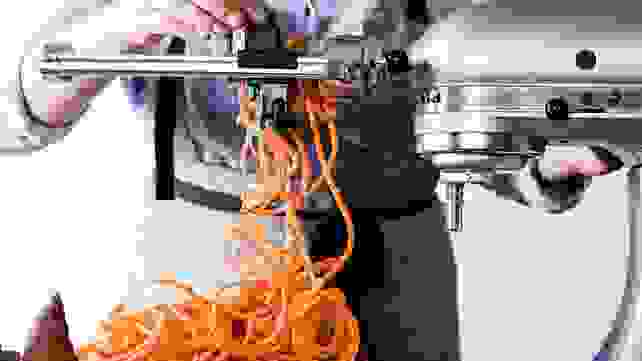 Instead, you can save yourself a little time and effort by easily cutting vegetable spirals with the Spiralizer Attachment for your KitchenAid. It’s practically a hands-off process, so you don’t have to worry about nicking your fingers. You'll feel so fancy creating your own pasta shapes. Sure, it’s a fair bit of work to make your own pasta from scratch, but the end result is totally worth it. 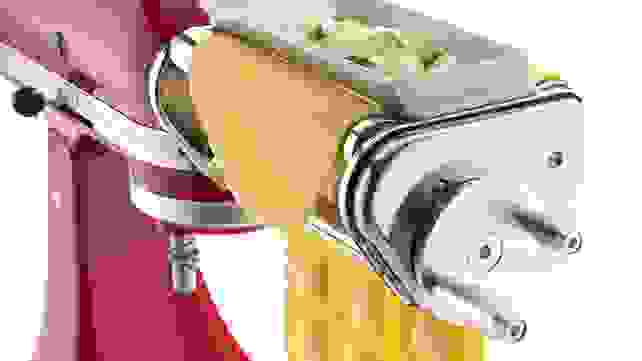 Your KitchenAid makes it easier than ever to create delectable homemade pasta thanks to its Pasta Press Attachment, which includes six different plates to make spaghetti, bucatini, rigatoni, fusilli, and even macaroni! What flavor ice cream would you make? I have a strange fascination with homemade ice cream, so this next attachment calls to me. With the KitchenAid Ice Cream Maker attachment, you can make 2 quarts of ice cream or sorbet in just 30 minutes! Just think of all the flavor combinations you could try. This feature doesn’t even require any special attachments! Using the regular KitchenAid paddle, you can easily shred chicken or pork—without slaving over the meat using just two forks. Simply put the meat you want to shred in the bowl and let the paddle do the work for you. Grind meat and stuff sausages using your mixer. You may have known there’s a meat grinder attachment for your KitchenAid mixer, but did you know it can make sausage, too? 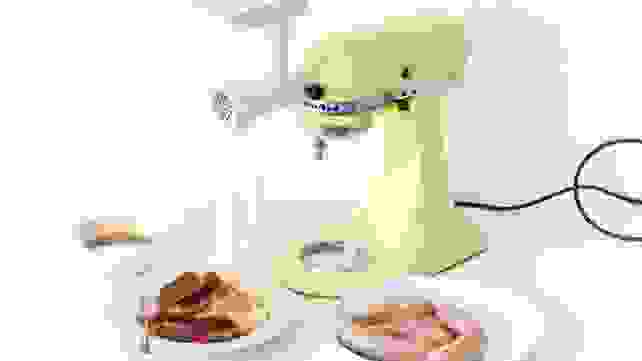 Just attach the little white tube onto the meat grinder, and you’ll be able to create your own homemade sausage—yum! Cut your vegetables any which way! Whether you’re making salsa or salad, or just prepping a recipe, your life will be a whole lot easier if you let your KitchenAid do the dicing and slicing for you. The Food Processor attachment is one of the more expensive options, but it can do so much. Plus, it drops your prepared veggies (or whatever) right into a bowl, so you’re spared having to scrape ingredients out of the container, and the attachment takes up a little less space than a traditional food processor. Hands-off potato peeling is finally a reality. 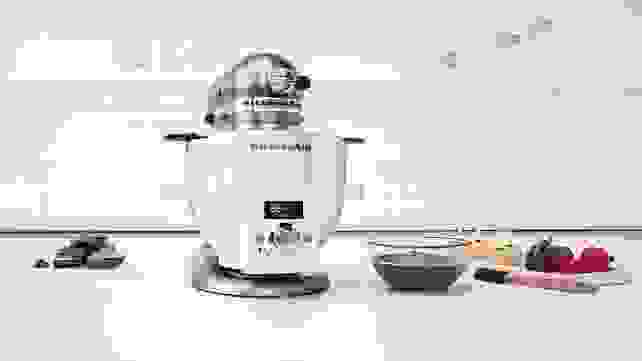 Is it cool that your KitchenAid can peel vegetables? Yes. 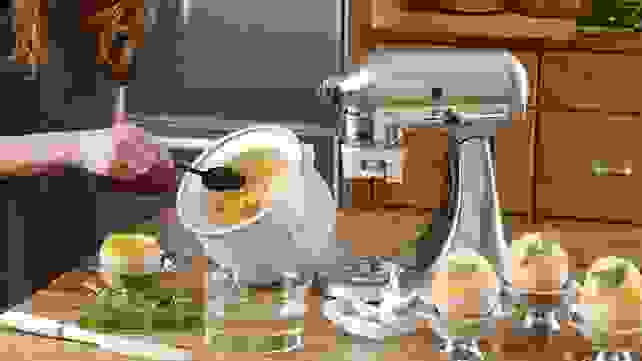 Do you really need your KitchenAid to peel vegetables for you? Eh, probably not. While a tad unnecessary, in my opinion, this jazzed-up spiralizer attachment can also peel, core and slice your veggies. I guess it might come in handy if you’re prepping a big meal and could use an extra set of hands, or if you're justnot that confident in your peeling skills. I didn’t use the dough hook that came with my KitchenAid mixer for a long time because, frankly, I didn’t realize what it was for. (I maintain that the name is misleading.) This weird-looking hook is actually designed to “knead” bread dough so you don’t have to do it by hand. It stretches and folds the dough, forming the gluten strands that give bread its structure and saving your arms from the next-day "I made too much bread" ache. It's easier than ever to make perfect ravioli. Apparently, this particular attachment has a bit of a learning curve. But once you figure out the best way to use it, you’ll be able to crank out fresh ravioli like nobody’s business. You put your filling in the top, feed in the pasta dough, then crank to create lovely uniform ravioli. Make fresh-squeezed juice in a flash. 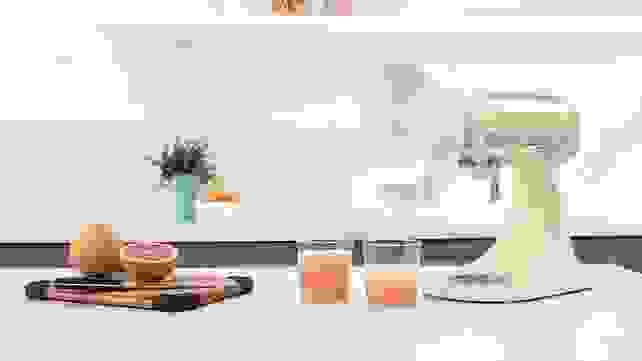 There are actually two different juicer attachments for your KitchenAid, and this is the simpler (and less expensive) of them. Essentially, you attach this bad boy to your mixer and it spins the reamer, letting you press citrus halves against it. It’s a faster, easier way to get fresh juice. This bowl lets you heat and stir at the same time. While most people probably don’t temper chocolate frequently enough for this to be a worthwhile investment, it’s still pretty cool. The Precise Heat Mixing Bowl lets you set a temperature and warm the contents of the bowl as they’re stirred. Basically, it’s great for tempering chocolate (which can be a pain to do by hand), but it can also be used for fondue and proofing dough. If you've ever wanted to make your own flour, here's your chance. I feel as though there’s a very specific target market for this next attachment, and I’m not it. 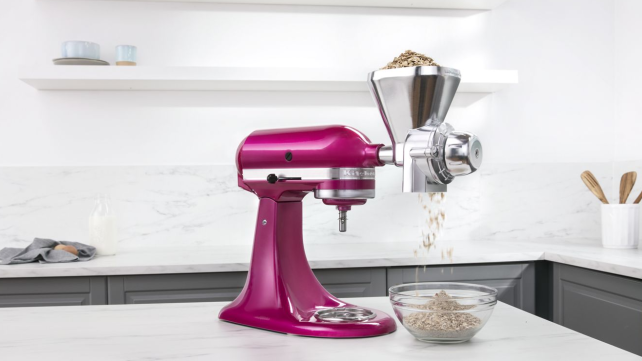 You can actually use your KitchenAid to grind grain and make your own flour. I’m not really sure when or why you’d want to do this, but if you know, leave your insights in the comments because I’m genuinely interested. No potato masher? No problem! Just throw your cooked spuds (plus milk and butter) into your mixer bowl with the paddle attachment and let it do the mashing for you. This is a great way to get smooth, creamy taters. 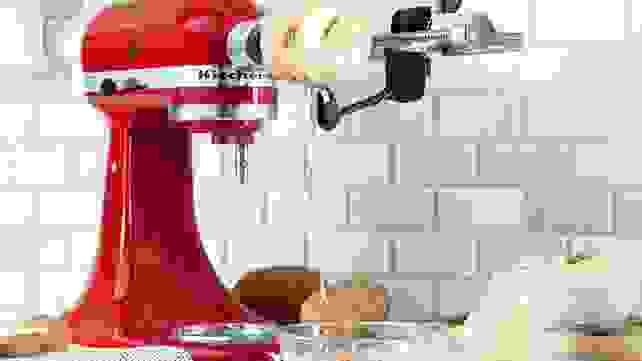 Make fruit purees with your KitchenAid mixer. If you want to make jam or even baby food, you could definitely get some use from the KitchenAid Fruit and Vegetable Strainer Set. This tool lets you strain or puree produce, and it comes with a food grinder, too! You won't need that box grater anymore! Shredding cheese on a grater is time-consuming and a little dangerous—who among us hasn’t accidentally skinned a finger doing this? If you’re all about fresh cheese for your tacos or pasta or whatever, you’ll love the Shredder Attachment for your KitchenAid mixer. This new attachment is a must-have for bakers. This final tool is every home baker’s dream. 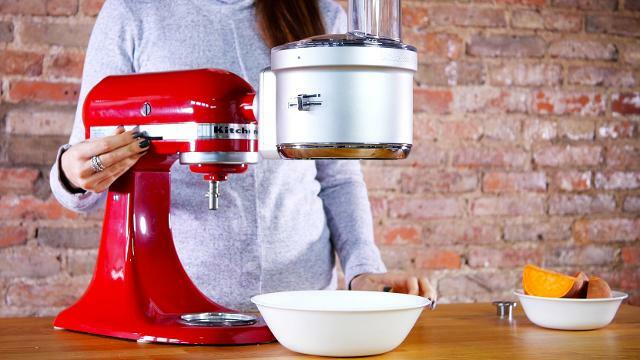 The latest and greatest KitchenAid attachment is a scale AND sifter in one, letting you measure out ingredients and sift them—without really any effort on your part. Bottom line: I’m asking for this for my birthday. Follow Reviewed on Facebook, Twitter, and Instagram.